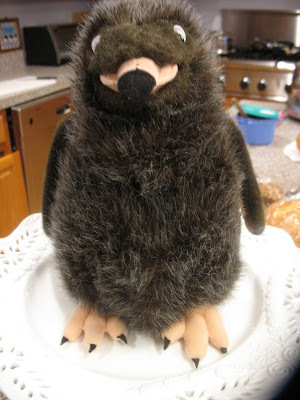 Cuisine Kathleen: Happy Ground Hog Day!!! I am joining Barb at Grits and Glamour for Tabletop Tuesday.. 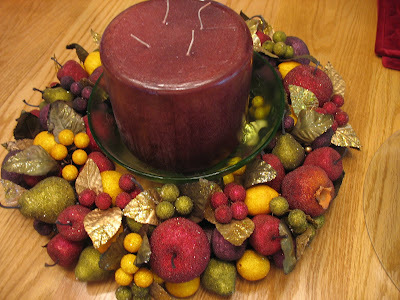 I bought this sugared Dellarobbia Wreath for 75% off, ($5) and decided to use it as a centerpiece for a tablescape.. 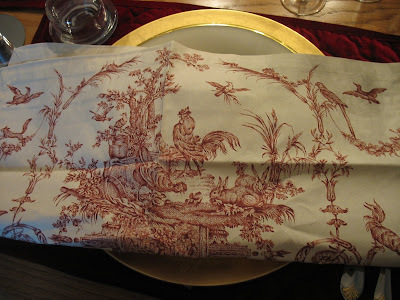 I used these toile napkins from WSonoma outlet.. 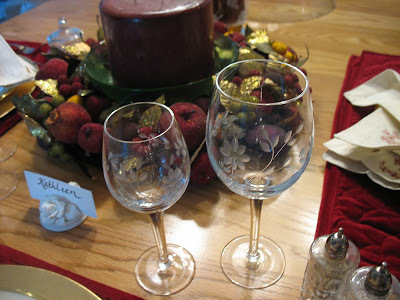 Etched glass stemware I have had a long time..gold trimmed flatware.. I had a terrible time with Live Writer tonight, so I had to resort to Blogger. I hope it is not my computer...Live Writer is so much easier! Ahhhh...add the napkins to my hope chest please :-) Love the ground hog. Lovin the groundhog,and just adore his little sleep cover. Precious. I have a feeling he won't be seeing anything tomorrow. I love you wreath, and with the candle it is so beautiful. Love the toile napkins, so pretty. A beautiful table setting. Just beautiful. LOL! That groundhog is just too cute! Nope, I doubt anyone will have "groundhog under glass!!" Love the red polka dot banner too! Your table looks so pretty! Kathleen, love the groundhog under glass! I'd forgotten tomorrow is G.H. Day! Very pretty tablescape you've set with that gorgeous centerpiece! The napkins are wonderful too especially with those napkin rings. Kathleen, that is one hairy thing! He needs a pedi! At least it doesn't shed! Maybe you can send him to the North Fork for the beagles to play with? Table looks very pretty! I love the wreath! Your table looks lovely.. I especially like your napkins and of course Groundhog Under Glass brought a big grin to my face..
Love the Ground Hog. For some reason our eldest daughter called them Grass Eaters....ground hog/grass eater. What a kid! I heard Phil saw his shadow, this morning. What a hoot! That stuffed animal is hilarious under the cloche! I just watched as Phil saw his shadow, so 6 more weeks of yuck! I am soooo ready for Spring! You must have your black belt in shopping, Lady. You find the bestest bargains! Your little cloche/butter covers are darling, too. O, so glad to have you back! I missed your cuteness!! That ground hog is a hoot. "Ground Hog under Glass"!! Love your pretty table....the wreath for 75% off? A steal! Happy belated birthday to grandson..I like whipped cream and sprinkles, too! Did the groundhog see his shadow this morning? Lovely as always...that little groundhog is adorable all scrunched up under glass! Love the napkins, they have roosters...need I say more? Happy Groundhog Day to you! Hi Kathleen, just gorgeous...as always. Your groundhog is too cute. I had problems with Live Writer also. Had to redo my entire post!!!! Well, now my kids want a groundhog! Lovely as always and a delightful giggle for the day! 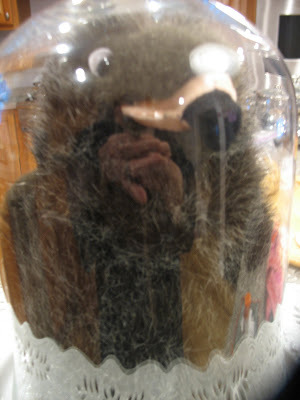 Love the groundhog under glass....you definetly need to make that an entry in Marty's next party. LOL. I have a horrible cold...and your Cuisine under glass...had me laughing so hard I think I collapsed a lung! Kathleen, you make me laugh out loud! That's the funniest photo of a groundhog I've ever seen. Seriously though, love the toile napkins and everything in your lovely tablescape. Thanks for the comment about Live Writer. I've never heard of it but it looks promising. Anything that makes blogging easier I'm all for! Absolutely love your groundhog, especially under glass. Toooo funny. Does he have a name? All respectable groundhogs have a name. Love the tablescape and those napkins...I need them. I love your Groundhog Under Glass - definitely the only one I've seen! So cute! Hope all's well! Your toile napkins and table are beautiful. Kathleen..when you brought him in from the cold,..and before you put him 'Under Glass'.. did you at least feed him some hot soup? 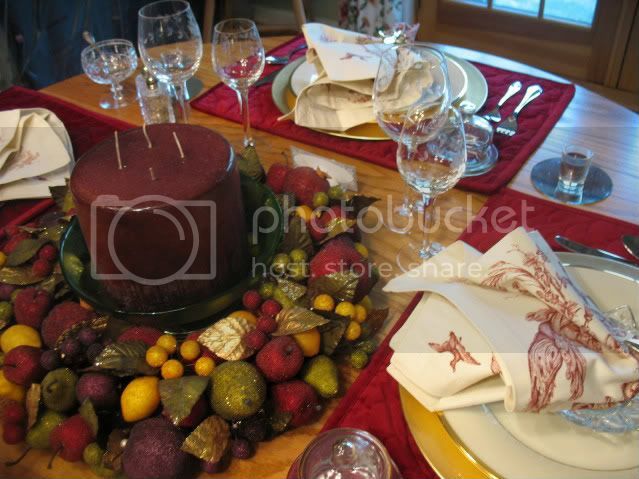 That wreath with the candle, is just beautiful, and what a great buy....lovely the toile napkins. Your table, as always...is another 'Show Stopper'!! I can't stop looking at your beautiful Valentine's tablescape. Your groundhog under glass is a hoot! Do you use the same recipe for groundhog under glass as for pheasant under glass? Kathleen, poor, poor groundhog ... He came out to look for his shadow and you stuff him under a cloche. In the second picture with his nose smashed against the cloche, he looks absolutely terrified. On a happier note, the della robia wreath is lovely and makes a wonderful centerpiece for your beautiful tablescape. Kathleen, I love your wreath and what a fantastic buy it was! When you get tired of the velvet placemats, just send them on over to me. Is that really a ground hog???? He's quite the critter. I love your new header and the one in your post is lovely. You have been busy!!! Your header is wonderful! I want to sit at that table! The groundhog made me laugh! I love the centerpiece, what is it about fruit on the table that makes it so welcoming? How cute is that groundhog?! 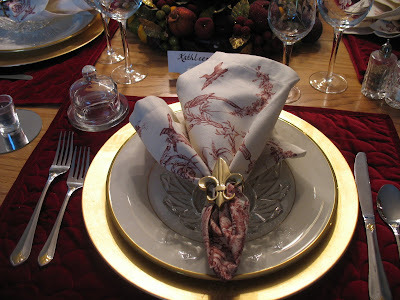 I love the toile napkins and the napkin rings! Your grounchog is too funny! Where on earth did you find him? LOL!This was a good read.Very entertaining. Foodie Friday~Are you ready for some Football?